On August 23rd, DCD welcomed back our newest Alumni to campus at the Class of 2018 BBQ. We heard stories of summer adventures along with enthusiasm for the next chapter in our graduates' academic journey. 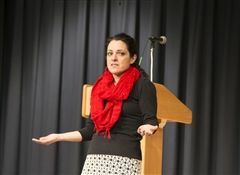 DCD 2017 Alumni Award recipient Monique Tello ’86, a doctor and writer, visited campus on November 30 to speak at an all-school morning assembly. Members of DCD's Class of 2013 gathered around the DCD pool on August 15 for a chance to reconnect with each other and some DCD faculty, before heading off to college or their next adventures. Morning Assembly All Jazzed Up! It was only the second day back at school, but it didn’t take DCD students and teachers long to get their groove back on! As part of DCD's Alumni Assembly series, Adam Rochelle’09 and Sam Rochelle’12 returned home to their familiar stage to play some tunes for the DCD community in a recent all school assembly. Last Thursday, current high school sophmore and DCD '14 alum Wil Linell was Thayer's starting pitcher for its varsity baseball game against Dexter. One of Dexter's star players is Wil's good friend and former DCD '14 classmate, Colin Mann. Unfortunately, Colin was sidelined due to a shoulder injury so the two did not get to faceoff. Wil and Colin co-captained DCD's 2014 baseball team. Mentors and Writers: Many places and many directions! As part of DCD’s Alumni Speaker Series, students were treated to a visit from Kate Woodworth, writer and member of the DCD class of 1965. Kate spoke to the audience about the importance and value of mentors and how a special mentor here at DCD inspired her to become a writer. 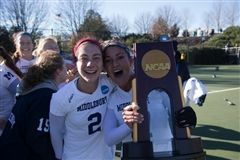 For only the second time in the school's history, Middlebury finally came away with the NCAA Division III title in field hockey, after coming close the past three years. Anna Kenyon, a senior and left midfielder, was instrumental in helping her team be ranked among in the top-four teams in the league the last four years. Click here to read the full article in the Dedham Transcript. This fall, Nobles played Thayer in varsity field hockey. Quite a few DCD alumnae participated in the game and are pictured here (Left to right: Liza Huschle, Kate Swanson, Allee Ayles, Cece Henderson, Sara Falkson, Abby King, Julia Cochran). Filmmaker Nick Papps '95 showed a recent film he made about the Fairbanks House along with a compilation of his recent work at morning assembly on September 29. A trio of jazz musicians, all DCD graduates who are now students at Milton Academy, performed at morning assembly on Monday, November 26.
opportunity for DCD alumni currently in Grade 9 through sophomore year of college to gain valuable work experience in an educational setting over the summer. Participants will have the opportunity to structure a summer in one of the following areas: Advancement (development, event planning, communications, alumni relations, marketing), Admissions, Horizons (summer learning program for kids from low-income families), Early Education (working with head of DCD's primary school), Facilities (helping with summer projects and maintenance), Technology Integration (incorporating technology into the classroom), and Head of School's office. DCD is looking for a commitment of 15 hours per week for a six-week period starting mid- to late June. The configuration of days, hours, and start/end dates will be determined with each student once he or she has been accepted into the program. Thanks to an anonymous donor, the internship will include a modest stipend. To be considered, a student must be a current high-school student, college freshman or sophomore. Applicants should be DCD graduates or have attended DCD for at least three years. To apply, please fill out the online form. Applications are due March 25, 2019. 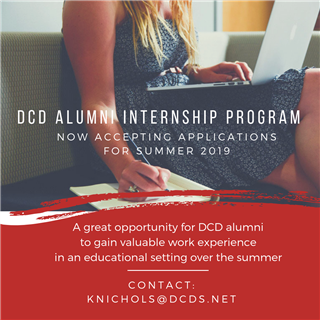 Please direct any questions to Kate Nichols at knichols@dcds.net or (781) 915-2562.